Although fasting before anaesthesia entails a significant effort and sacrifice on the part of the patient who is preparing for a procedure, investigation or surgery, it is essential in order to minimise the volume of stomach contents and reduce stomach acidity. This is of great importance because during general anaesthesia or sedation there can be regurgitation (upward movement) of these contents, with the associated risk of pulmonary aspiration. Pulmonary aspiration, of even small amounts of stomach contents, has been associated with serious and sometimes life-threatening complications, including airway obstruction, an inflammation of the lining of the lung, known as pneumonitis, development of chest infection, respiratory failure, and unexpected admission to intensive care. The aim of pre-operative fasting, that is the planned witholding of both solid food and fluids, is therefore to minimise stomach contents and therefore lessen the risk that these pose during anaesthesia. 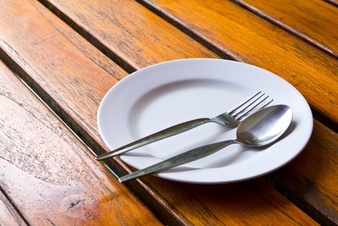 The pre-operative fasting period depends on the type of food and fluids consumed, as well as the timing of the procedure (whether it will happen in the morning or in the afternoon). Solids, milk and milk-containing drinks (more than one-fifth containing milk) should not be consumed within 6 hours of the start of an operation (milk curdles in the stomach and becomes a solid). One should avoid heavy or fatty meals pre-operatively, even on the eve of surgery, as these food contents remain in the stomach for much longer (> 8 hours), being slower to digest than other foods. Sweets and chewing gum are viewed as solids and should not be taken for 6 hours prior to the start of the procedure. Still water should be allowed and indeed encouraged up to 2 hours before anaesthesia. This same recommendation also applies to clear fluids. A clear fluid is one where newsprint is visible through a glass of the liquid. These include water, fruit squash, black tea or black coffee, diluted juices and non-fizzy energy drinks. Carbonated beverages should be discouraged before anaesthesia. Clear fluids should not contain alcohol or pulp (pieces of fruit). Water actually encourages stomach emptying and a small volume of water (a few sips) may be given with the patient’s usual medication or with a pre-medication tablet up to 30 mins before anaesthesia. At pre-operative assessment, one should be made familiar with the hospital’s pre-operative fasting guidelines, and should be given the necessary and specific information in this respect, ideally also in written form or by means of a printed patient information leaflet. One should also be given sufficient opportunity to ask questions and clarify any misunderstandings that one might have in this respect. The guideline, included in table form at the end of this article, follows what is now described. For a morning surgery or procedure, one should be fasted and ready for anaesthesia at 8:30AM. This means that no solids should be consumed after midnight (24:00h). You can drink water or clear fluids in moderation until 06:30AM. Most patient information leaflets now recommend drinking water only 2 hours before surgery requiring anaesthesia, in order to simplify instructions and prevent cancellation of surgery due to ingestion of unacceptable fluids by mistake (e.g. erroneously taking tea with milk at 6:30AM). In the case of an afternoon procedure, one should be fasted for anaesthesia to start at 13:00h. This means that a light breakfast should be allowed before 07:00AM, and no solids should then be consumed after that time. Examples of a suitably light breakfast include a small bowl of cereal (not high in fibre) with skimmed or semi-skimmed milk, or a slice of toast and a cup of tea, coffee, or fruit juice. No high fibre cereals such as bran, weetabix or muesli should be consumed, and fatty foods such as cold meats or fried food should be avoided. Still water should again be encouraged up to 2 hours before the procedure i.e. up to 11:00AM. If one is to have surgery as part of a long operating list, and one happens to be the last case or the one before the last on the list, it is good practice to avoid unnecessarily prolonged fasting by considering and managing such a case as an afternoon case (i.e. light breakfast before 07:00AM, no solids thereafter, and still water until 11:00AM). There are many risk factors that may delay stomach emptying and also increase the chance of regurgitation and subsequent aspiration, while under anaesthesia or sedation. These include obesity, gastro-intestinal pathology such as gastro-oesophageal reflux and hiatus hernia, renal failure, diabetes mellitus, anxiety, trauma, neurological disease and pregnancy amongst others. When your anaesthetist recognises such an increased risk , you may be prescribed certain medications to decrease stomach acidity, and you might also be instructed to withold water for a greater period of time ahead of your procedure (>2hours). Children should be scheduled at the start of lists, with the youngest going first, in order to minimise starvation times as much as possible. No solids, milk, or cow’s milk, should be given for 6 hours prior to anaesthesia. No breast milk should be given for 4 hours before anaesthesia. Clear fluids may be given up to 2 hours before the procedure. Women in labour are considered to be at increased risk of gastro-oesophageal reflux. If they have a favourable obstetric history, and are planned for a normal delivery, having a low risk of requiring obstetric intervention, they may be allowed to eat and drink during labour. Again, avoiding large, heavy or fatty meals and carbonated beverages, during this time is advisable and considered to be good and safe practice. In the case of a higher risk pregnancy (including those women who have an epidural inserted for pain relief during labour), women should be encouraged to drink clear, still fluids only. Women scheduled for planned caesarean section should be starved as per normal pre-operative guidelines (no solids or milk for 6 hours prior to anaesthesia, still water up to 2 hours before). If you are having a procedure under regional anaesthesia (spinal, epidural or peripheral nerve block) you should be fasted as for a general anaesthetic. This is because you might require additional sedation or more uncommonly conversion to a general anaesthetic. If you require local anaesthesia only, you will be instructed that no period of pre-operative fasting is required, and you may therefore eat a normal diet on the day of surgery. If one is scheduled to receive intravenous sedation for a procedure (e.g. gastroscopy or colonoscopy) or minor surgery, this again necessitates that one is fully fasted pre-operatively, as already outlined above and as described in the below guideline. In the case of urgent or emergency surgery, whenever it is advisable and possible, this should be delayed in order to allow the fasting times to be adhered to. When this is not possible, and the urgency of the procedure takes precedence, your anaesthetist should be adequately informed beforehand, and will modify the anaesthetic technique in order to lessen the risk of regurgitation of stomach contents. One must also mention a point, and mostly directed at healthcare personnel, that fasting advice and guidelines also have the aim of lessening the incidence of unnecessary or prolonged fasting before surgery. This is very unpleasant for patients and may result in dehydration (especially during the summer period), hypoglycaemia (particularly in diabetics), electrolyte abnormalities, irritability (usually in children), anxiety, increased nausea and vomiting, and confusion (especially in the elderly). Where patients have been fasted for fluid for over 6 hours, it is a good idea for ward staff to contact the anaesthetist, to ask whether it would be acceptable or advisable for the patient in question to have a drink of still water, or as to whether an IV fluid infusion should be started. Adults and children should generally be allowed to resume drinking as soon as they wish, and feel able to, following planned surgery. Normal fluid intake however need not be insisted upon before allowing discharge from a day surgery facility. I. Smith, P. Kranke, I. Murat, A. Smith et al. : Perioperative fasting in adults and children: guidelines from the European Society of Anaesthesiology. Eur J Anaesthesiol 2011; 28:556-569. Royal Cornwall Hospitals, NHS Trust: A Policy for Fasting Patients who Require Anaesthesia or Intravenous Sedation. V 5.0, August 2016. K.G. Allman, I.H. Wilson: Oxford Handbook of Anaesthesia (2001) pgs9-10. Mater Dei Hospital: Guidelines for Pre-Operative Fasting – Dept. of Anaesthesia and Critical Care. Guideline: ACC/01Guide/ 2009v1.0 (2009). Ghalkemm li wiehed isum qabel operazzjoni igib mieghu xi ftit sagrificcju u certa skumdita, dan huwa tassew essenzjali biex il-pazjent jkun cert li jkollu l-istonku vojt, u jnaqqas l-actu kemm jista jkun, qabel ma jidhol biex jiehu l-loppju. Dan huwa importanti ghaliex waqt il-loppju, jew meta tkun imheddel, jista jigri li tirremetti w itella l-istonku, bir-risultat li waqt li tkun ghadek taht il-loppju dan jista jinzel fil-pulmun u jaghmel hafna hsara. Anke ammont zghir ta likwidu mill-istonku jaghmel hafna hsara fil-pulmun, u johloq komplikazzjonijiet serji fosthom infjammazjoni qawwija tal-pulmun, sadd fil-pajpijiet tan-nifs (fil-kaz ta’ ikel solidu), rih fil-pulmun, kif ukoll bzonn li tircievi kura intensiva ghall-gharrieda u bla dewmien. Ghalhekk, l-iskop wara is-sawm qabel operazzjoni hu biex l-istonku ikun battal kemm jista jkun, u b’hekk wiehed inaqqas hafna ir-riskju ta dan li ghadna kemm semmejna. L-ammont ta’ hin li wiehed ghandu jsum jiddependi kemm fuq it-tip ta ikel u xorb, kif ukoll fuq il-hin tal-jum li fih jkun ser isir l-intervent (filghodu jew wara nofs in-nhar). Ikel solidu, halib jew xorb li fih halib (iktar minn ghoxrin fil-mija) , mghandux jittiehed inqas minn sitt sieghat qabel l-operazzjoni. Il-halib jaghqad fl-istonku u ghalhekk idum iktar biex jitbattal. M’ghandekx tiekol ikel tqil, hafna laham, jew ikel xahmi qabel operazzjoni, lanqas il-lejl ta’ qabel, ghaliex dan ix-xorta ta’ ikel idum bosta sieghat biex jinhadem u jitbattal mill-istonku. Helu, jew chewing gum, jitqisu bhala solidi u mghandhomx jittiehdu inqas minn sitt sighat qabel ma wiehed jidhol ghall-loppju. M’ghandekx tpejjep ukoll qabel operazzjoni. Wiehed ghandu jixrob ilma jew likwidi cari sa saghtejn qabel l-intervent. Likwidi cari huma dawk li tista tara minn go fihom u fosthom hemm ‘squash’, te jew kafe minghajr halib, frott maghsur minghajr bicciet, kif ukoll certa ‘energy drinks’. Is-‘soft drinks’ m’ghandhomx jittiehdu qabel operazzjoni, ghaliex fihom hafna gass u ghalhekk jistghu jneffhu l-istonku. Wiehed irid ukoll jevita xorb alkoholiku qabel il-loppju. L-ilma, anke f’ammont zghir, jghin biex l-istonku jitbattal. Wiehed ghandu jiehu ftit ilma (15-30ml) biex tghinu jibla’ il-pilloli tas-soltu, kif ukoll xi kalmant jew medicina ohra li tista tinghata mit-tabib tal-loppju, u jista’ jaghmel dan sa nofs siegha qabel l-operazzjoni. Meta tmur l-isptar ghal vista ta qabel l-operazzjoni (‘il-pre-operative assessment’), hemmhekk ghandek tinghata informazzjoni dwar meta u kif ghandek issum. Ghandek tinghata dan ukoll bil-miktub, per ezempju permezz ta’ fuljett tal-informazzjoni. Ghandek ukoll tinghata hin bizzejjed biex tistaqsi xi mistoqsijiet li jista’ jkollok, biex b’hekk tkun zgur li fhimt sew kif ghandek issum. Ghal-operazzjoni li ser issir filghodu, wiehed jehtieg li jkun sajjem u lest biex jiehu l-loppju fit-tmienja u nofs ta’ filghodu. Dan ifisser li wiehed ghandu jiekol ikel solidu sa nofs il-lejl (24:00). Tista’ izda tixrob ilma jew likwidi cari, minghajr ma’ tesagera, sas-sitta w nofs ta’ filghodu (06:30AM). Illum qeghdin nirrikmandaw li wiehed jixrob ilma biss saghtejn qabel il-loppju u mhux xorb iehor. Fil-kaz li l-operazzjoni tieghek tkun ser issir wara nofs in-nhar, inti tehtieg li tkun sajjem fis-siegha ta’ wara nofs in-nhar (13:00). Dan ifisser li wiehed jista’ u ghandu jiehu kolazzjon hafif qabel is-sebgha ta’ filghodu (07:00AM). Wara dan il-hin m’ghandux jittiekel ebda ikel u lanqas xorb bil-halib jew bicciet. Kolazzjon hafif u adatt jista jkun maghmul minn cerejali tal-qamh li ma jkollomx ammont kbir ta’ fibra, xi bicca hobz mixwija, u tazza te’ jew kafe’ bil-halib, jew frott maghsur. Tiehux cerejali bhal-‘bran’, ‘weetabix’ jew ‘muesli’ u lanqas ikel tqil jew xahmi bhal kolazzjon ingliz (‘fried english breakfast’), jew hafna perzut jew laham ippreservat. Ghandek tixrob ilma minghajr gass (‘still’) sa saghtejn qabel l-operazzjoni, jigifieri sal-hdax ta’ filghodu (11:00AM). Jekk wiehed ikun lejn l-ahhar ta’ lista twila tal-operazzjonijiet, dan ghandu jitqies bhala kaz li ha jsehh wara nofs in-nhar, u ghalhekk ghandu jithalla jiehu kolazzjon hafif qabel is-sebgha ta’ filghodu, u ilma sal-hdax ta’ filghodu, kif ghadna kemm spjegajna. Dan biex dak li jkun ma joqghodx sajjem iz-zejjed u minghajr bzonn. Hemm hafna kondizzjonijiet li jistghu jgeghlu l-istonku jitbattal iktar bil-mod, u b’hekk izidu r-riskju li wiehed itella u jirremetti waqt il-loppju. Fost l-ohrajn, ta’ min isemmi il-piz zejjed, il-ftuq ta’ l-istonku (‘hiatus hernia’), l-actu zejjed (‘gastro-oesophageal reflux’), iz-zokkor, ansjeta zejda, korriment serju, it-tqala, mard tal-kliewi u dak newrologiku. Meta it-tabib tal-loppju jintebah b’dawn il-kondizzjonijiet, dan jista’ jtik certu medicini li jnaqqsu l-actu fl-istonku, kif wkoll itik il-parir li ma tixrob xejn ghal aktar minn saghtejn qabel l-intervent kirurgiku. It-tfal ghandhom ikunu minn tal-ewwel fuq il-lista tal-operazzjonijiet, biex b’hekk dawn jistennew l-anqas possibli. Jekk ikun hemm numru ta’ tfal fuq lista, dawk li huma l-izghar fl-eta’ ghandhom isiru l-ewwel. M’ghandekx titmaghhom ikel solidu jew ittihom halib tal-baqra, inqas minn sitt sighat qabel il-loppju. M’ghandekx tisqi t-tarbija halib tas-sider inqas minn erba sieghat qabel il-loppju. Ilma jew likwidi cari jistghaw jinghataw sa saghtejn qabel l-operazzjoni. Kif semmejna in-nisa tqal ghandhom iktar riskju ta’ actu gholi fl-istonku u li jistghu jirremettu waqt il-loppju. Jekk ma kellhomx komplikazzjonijiet waqt it-tqala, u l-pjan hu l-jehilsu b’mod normali, u mhux permezz ta’ operazzjoni jew intervent obstettriku, dawn ghandhom jithallew jieklu w jixorbu waqt il-hlas. Xorta wahda ghandu jinghata il-parir, li kemm jista jkun, ma’ jieklux ikel tqil jew li fih hafna xahmijiet, u li ma’ jixorbux ‘soft drinks’ waqt il-hlas. Fil-kaz ta’ tqala bil-komplikazzjonijiet, jew fejn hemm cans gholi li jkun hemm bzonn intervent, u anke fil-kaz fejn il-mara tqila tkun tixtieq loppju epidurali biex jittaffa l-ugigh tal-hlas, il-mara ghandha tixrob ilma jew likwidi cari biss waqt il-hlas. Nisa tqal li ha jkollhom operazzjoni tac-cesarja (‘caesarean section’) li mhux urgenti jew emergenza, ghandhom isumu bhalma spjegajna qabel (li issum mill-ikel u xorb bil-halib, jew bicciet, ghal-sitt sighat, u li tixrob ilma sa saghtejn qabel il-loppju). Jekk tkun ser tircievi loppju li jraqqad parti minn gismek biss, per ezempju blokk tan-nervituri tas-sieq, jew dak li jissejjah loppju mid-dahar (spinali jew epidurali), ghandek xorta wahda issum sew kif spjegajna. Dan ghaliex, qabel ma’ tibda jew fil-bidu tal-operazzjoni, tista tehtieg li tinghata medicini li jheddluk jew sahansitra loppju biex torqod kompletament xorta wahda. Jekk tkun ser taghmel operazzjoni jew procedura bil-lokal biss (anestesija lokali), m’ghandekx bzonn li ssum, u ghalhekk tista tiekol u tixrob b’mod normali dak in-nar ta’ l-intervent kirurgiku. Jekk qed thejji ruhek ghall-istrument tal-istonku jew il-musrana (‘gastroscopy’ jew ‘colonoscopy’), jew ghal xi operazzjoni zghira l-issir taht medicina li theddel fil-fond (‘intravenous sedation’), ghandek ukoll tkun sajjem jew sajma, kif spjegajna qabel, u kif turi l-linja gwida li ssegwi hawn taht. Fil-kaz ta’ operazzjoni urgenti li tista’ tistenna ftit sighat, din ghandha tigi posposta sakemm wiehed ikun tabilhaqq sajjem. Jekk minn naha l-ohra, ikun kaz ta’ emergenza li ma tistax tistenna, l-urgenza tal-procedura trid tiehu l-precedenza, u ghalhekk issir l-operazzjoni xorta u minghajr dewmien. F’dan il-kaz it-tabib tal-loppju jigi mgharraf li l-pazjent ma jkunx sajjem, u jiehu prekawzjonijiet billi jbiddel xi ftit il-mod li bih jinghata l-loppju, biex b’hekk inaqqas ir-riskju li wiehed jirremetti waqt il-loppju u l-intervent. Wiehed jista jsemmi, l-iktar ghal-benefficju tal-haddiema fil-qasam mediku, li il-pariri u l-linja gwida dwar is-sawm qabel l-operazzjoni w l-loppju, ghandhom ukoll l-iskop li jnaqqsu c-cans li wiehed jispicca isum iz-zejjed u minghajr bzonn. Dan huwa ta’ skumdita ghal pazjent u jista wkoll jikkawza jew jikkontribixxi ghal nixfa minn gewwa (‘dehydration’), li jaqa iz-zokkor fid-demm, li jithawwad il-bilanc tal-melh fid-demm, tqanzih zejjed (b’ mod specjali fit-tfal), izjed cans ta’ dardir u taqlih, u iktar cans fl-anzjani li tithawwad ghal gharrieda. Huwa ghalhekk, li jekk wiehed jintebah li pazjent ilu sajjem anke mix-xorb ghal iktar minn sitt sighat, huwa att siewi li wiehed jikkuntattja t-tabib tal-loppju, u jiehu parir biex jara jekk dan il-pazjent ghandux jinghata ftit ilma biex jitrejjaq, jew inkella ghandux jinbeda ‘drip’ fil-vina. Tfal u kbar ghandhom jergghu jibdew jixorbu wara l-loppju w operazzjoni, li ma kinetx urgenti, meta jkollhom aptit u jhossuhom tajbin biex jaghmlu dan. M’hemmx ghalfejn ta dewmien zejjed wara l-loppju, qabel ma wiehed jerga’ jibda jixrob mil-gdid. Minn naha l-ohra, mhuwiex bzonn assolut li wiehed jixrob sew qabel ma jintbaghat id-dar wara operazzjoni mhux magguri li tkun saret dak in-nhar stess.